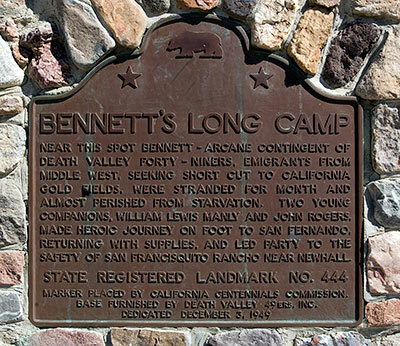 Near this spot Bennett - Arcane contingent of Death Valley Forty - Niners, emigrants from Middle West, seeking short cut to California gold fields, were stranded for month and almost perished from starvation. Two young companions, William Lewis Manley and John Rogers, made heroic journey on foot to San Fernando, returning with supplies, and led party to the safety of San Francisquito Rancho near Newhall. Base Furnished by Death Valley 49ers Inc. 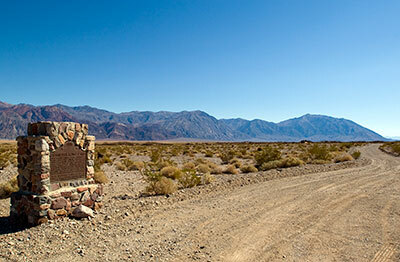 This plaque is one of a series commemorating the Forty-Niner Expedition through Death Valley. The other plaques are: Death Valley Gateway, Burned Wagons Point and Valley Wells.